In Sold on the Courthouse Steps, we discussed three types of sales of enslaved people through the local court system. We suggested that you search through newspapers to discover sheriff sales, equity court sales, and chancery court sales. Here are a few more sales notices along with what we can glean from each one. For decades, enslaved people confined to the Charleston Work House were also employed by them. It was situated in the same square as the Old Charleston County Jail. Rosena, a runaway, spent a year in the Work House. Afterwards, she was offered up for sale in the courthouse yard on October 14, 1857 in accordance with the Ordinance of the City of Charleston to pay for the expenses for keeping her confined to the Work House. 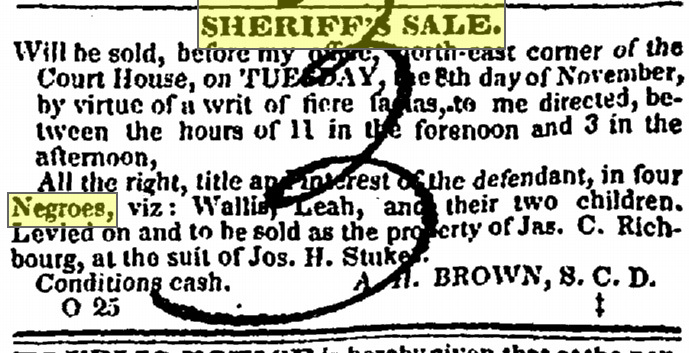 To document the sale of Rosena, you could consult the sheriff sales book, deeds, and bills of sale. Charleston Courier, October 14, 1857: accessed April 11, 2016, http://infoweb.newsbank.com/resources/doc/nb/image/v2:11A09312E50DDED0@EANX-NB-1318139D67280088@2399602-1315BEF1AD892E48@2-139780E098A1E7F3@No Headline?p=EANX-NB. Jas. C. Richbourg was sued in 1842. 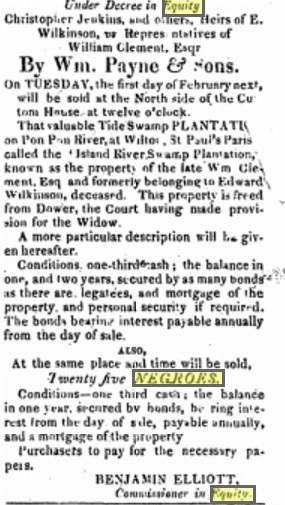 To pay his debt, this advertisement gives notice about Wallis and Leah who were to be sold along with their two children at the northeast corner of the courthouse on November 8, 1842. The sheriff sales book should provide the name of the purchaser. Also check deeds and bills of sales that mention the person who made the purchase of Wallis and Leah. Charleston Courier, October 29, 1842: accessed April 11, 2016, http://infoweb.newsbank.com/resources/doc/nb/image/v2:11A09312E50DDED0@EANX-NB-131867EE2D489720@2394138-13165C91E98E9878@2-1394AECCBB910FE4@No Headline?p=EANX-NB. It is quite disheartening to see ancestors advertised to be sold along with houses as forms of property, however, you come to comprehend the possibilities that exist for finding them in historical records as you would land or a house. They appear on deeds and mortgages. You should consult these resources for the possibility that your ancestors who were enslaved may be mentioned. In the advertisement below on January 3, 1843 at noon at the Charleston County Courthouse, the enslaved people below were sold to pay defendant’s debts. Avenues of research include records to document the enslaved people, the defendants, and the plaintiffs. Charleston Courier, January 02, 1843: accessed April 12, 2016, http://infoweb.newsbank.com/resources/doc/nb/image/v2:11A09312E50DDED0@EANX-NB-131F57CB986A4650@2394203-131AF0D57B9134E0@2-138EC5D7D9A32A10@No Headline?p=EANX-NB. In cases where the decedent left property and had financial obligations that were not satisfied, that property was sold in the court of equity and applied to the remaining debts. Another reason for selling property was to divide the inheritance equally between the heirs. 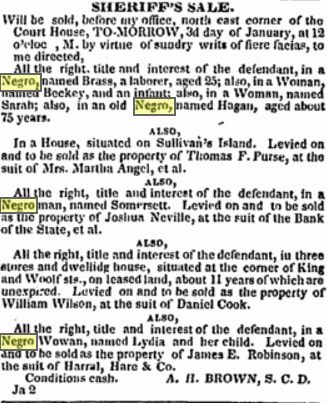 Twenty-five “Negroes” were sold from the estate of Wm. Clement, owner of Island River Swamp Plantation. Searching records documenting this sale in equity court could tell you who made purchases and the names of the individuals sold. Knowing the names of people who purchased the enslaved people (and their names) will hopefully help you to discover their future whereabouts. Charleston Mercury, January 24, 1825: 3, accessed April 12, 2016, http://infoweb.newsbank.com/resources/doc/nb/image/v2:1116E1B9DF7C4D80@EANX-NB-153D28D9CA8D56F8@2387651-153D1B18362FCBB0@2-153DBD176C9E1A98@?p=EANX-NB. Identify online historical newspapers that are searchable prior to 1865. Locate a notice or advertisement for a sheriff sale or equity court sale (not a private sale). Try to discern what courthouse records you would access to learn more about the enslaved people advertised to be sold. Look for confirmation that the sale actually took place. Let us know how about your success by commenting on the Facebook post for this article. Need help with your own genealogy research? Come join our Facebook research group and post your questions! Remember to post each question as its own post, so we’ll be sure to see it.